When I was a boy I don't think we had stroller toys or rattles. I think I just played with my mom's keys except when we went grocery shopping. Apparently when I was in grocery stores I would play with Jello boxes and bread eating through both of their packaging. Warning: it looks much nicer in person. Now there are a bunch of things out there Velcro® onto a stroller to keep your baby occupied. We just received this cute rattle the other day. 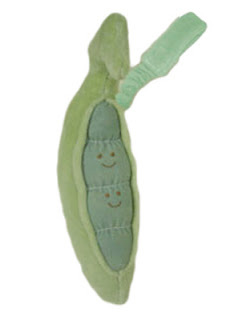 Made by MiYim: Simply Organic it's a cute little pea pod stroller rattle with a small elastic piece that connects to your stroller. We have the Under the Nile Veggie Crate and this is a great way for the little MF to take his/her when we're out. It's super soft and the color is really nice. Miyim dyes the organic cotton in a water bath with dyes from plants and minerals. As it says on the packaging it's "free of harmful substances, from start to finish." We're buying a lot of organic and fair labor stuff for our pre-kid. In fact he/she will have more of that type of stuff than we have. I think it's easier to do with a child because we're starting fresh but also a bunch of smaller companies are out there making organic products for kids. It makes sense to me because most of this stuff ends up in their mouths. Although I'm not all freaky about everything out there. I was probably chomping on lead paint as a kid and I'd always play with mercury when a thermometer broke. Still if there is a cool alternative and I can support a smaller company I'll do it.